I wound up making 3 batches from the two recipes I thought would be the closest match. (I had only planned on two, but I kinda screwed up one of them and so came the third). Fair warning, these things are super-time-suckers. (no wonder they are $5 each in NYC!) One recipe came from Food52.com (this recipe was definitely inferior for reasons I’ll explain later.) and a British recipe supposedly right from the baker that makes the famous London Cronuts. (This is the one I screwed up and made twice). Both recipes are infuriatingly vague (as corroborated by the scores of irate comments on their respective pages), I suspect on purpose, leaving us poor DIY’ers in tears, throwing wads of dough out the window. (don’t do that, it sticks to everything.) 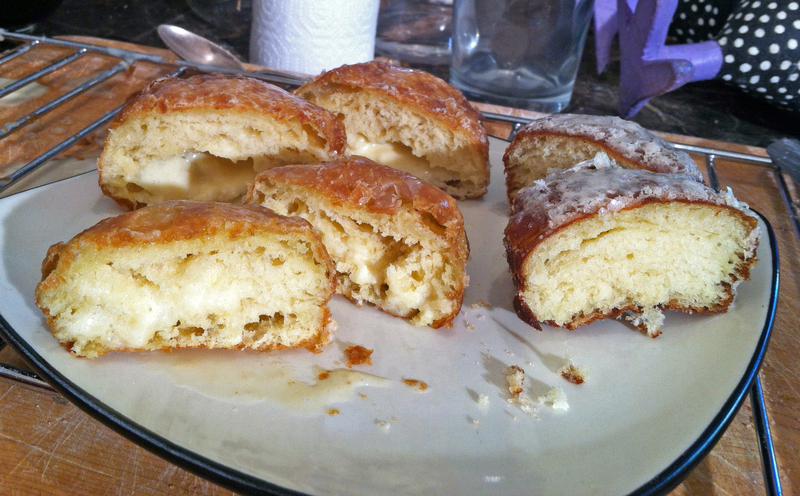 I did my best to fill in the holes in the recipes, but experience is the best teacher, and so I will continue to try and perfect the Elusive Cronut. I’ll go step by step through what I did, and what I’ll do differently next time. The Food52 recipe was pretty straightforward, just mixing up the ingredients without the butter, then chilling the dough. The Britt recipe was more complicated, and had one big fat problem. First, you were to combine the dry ingredients, then cut the butter into the flour (of course they did NOT tell you the butter has to be very COLD) You want decent bits of butter in there. The fatal flaw came when they told you to warm the milk and yeast, then add it to the mix. And guess what? It melted the butter of course, which negates the whole point of the chunky butter bits. Sigh. (this was the “screw-up” recipe for that reason. 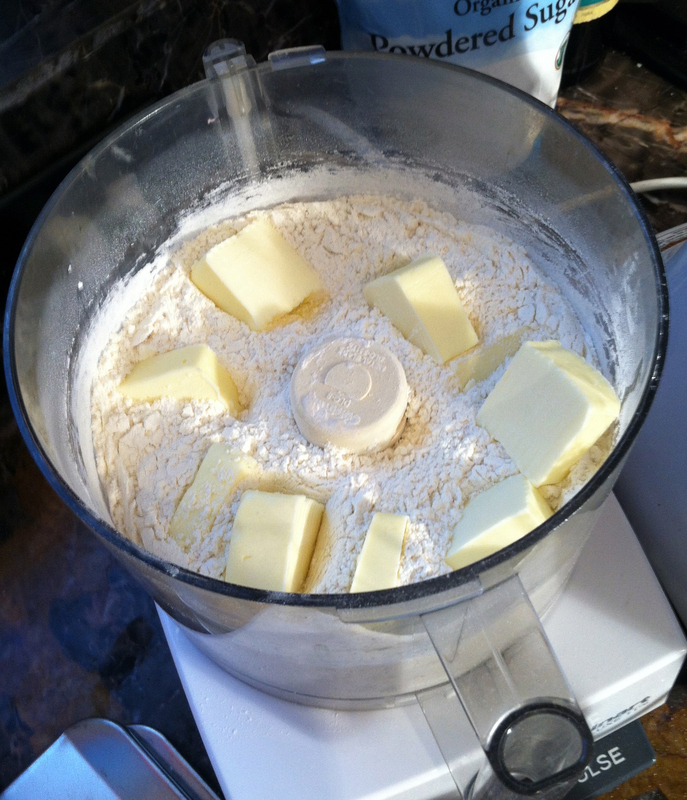 I tried it again, this time mixing the milk/yeast mixture, and THEN the cold hard butter. Not much of an improvement but I went with it. What I’ll do Differently Next Time: Next time I’ll try letting the milk/yeast cool to room temp first before adding it to the butter-chunk dough, and quickly blending, mixing as little as possible to form the dough. At this point, all three doughs were treated the same, covered with plastic wrap and stuck in the fridge to chill for 30 minutes. 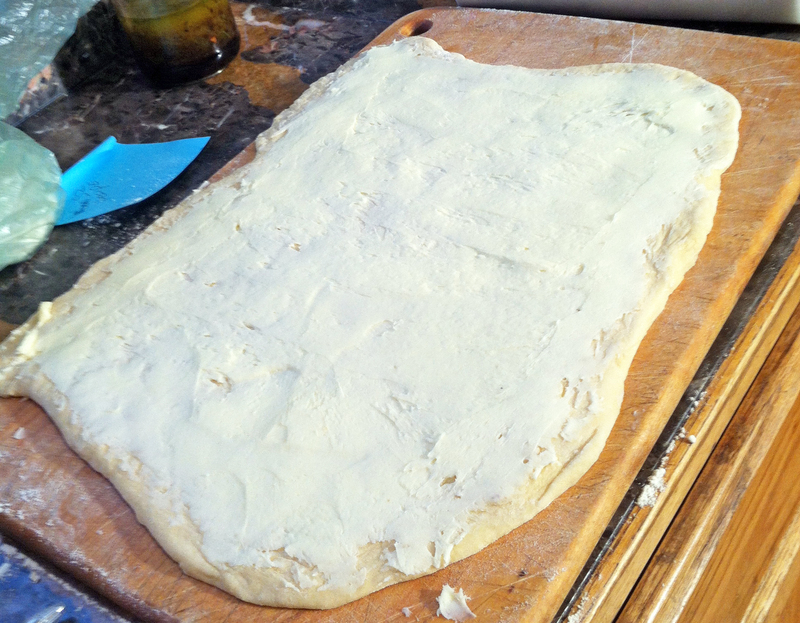 With both recipes, you are instructed to roll out the dough into a rectangle about 13 x 18, fold it over like a letter into thirds, and put back into the fridge to chill again. The exception is the Food52 Recipe in which you spread your room-temperature butter over the chilled dough. This step was a challenge, as the butter pulled up the dough, even chilled as it was, and I wound up ditching my pastry spatula for fingers. (and yes, I know my rectangles could use some work). 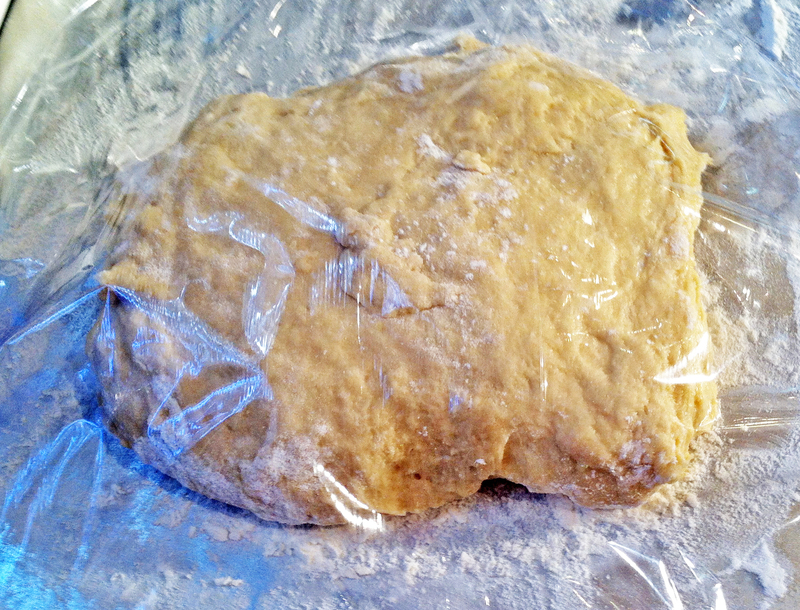 At this point you are to put your letter-folded dough back in the fridge and chill again for at least 30 minutes. And take it out and roll and fold again. And then do that one more time. (for 4 total folding/chilling sessions. The final Chill Session is overnight, which I did. 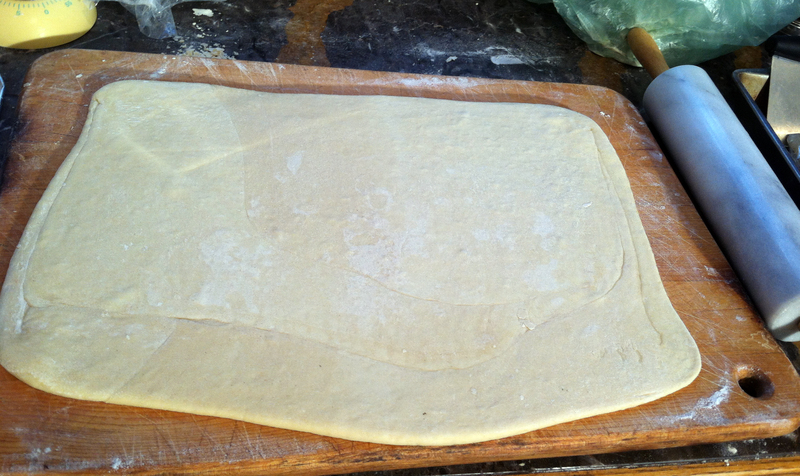 I will say the Britt recipe dough was more stiff and tough to roll. 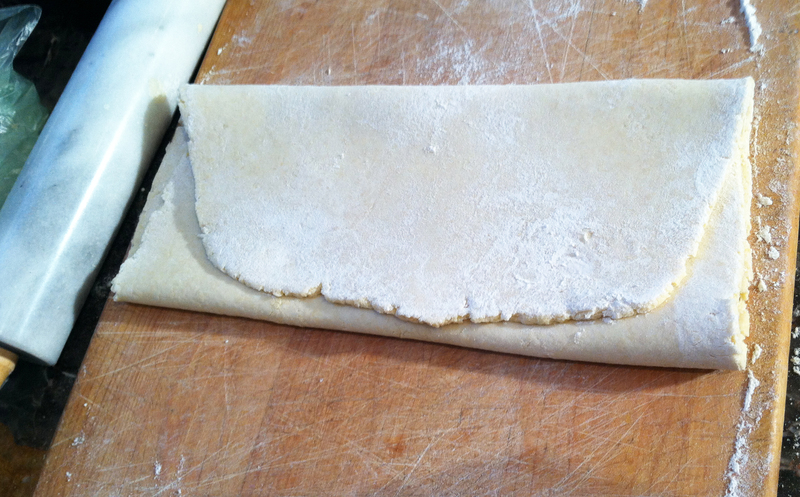 Vague-Alert: Neither of these recipes explained this folding and rolling process very well. I suspect there’s something missing… What I’ll do Differently Next Time: I’ll try letting the dough sit for a few minutes before rolling it out so I’m not having to push so hard. After my semi-failure at the end result, I researched how Croissant are made, and discovered that the dough is folded TWO times between chillings (once side to side, then turned 90 degrees, rolled again and folded the other way) This was not mentioned in either recipe, but I will do it next time. I will also try to make a better rectangle. 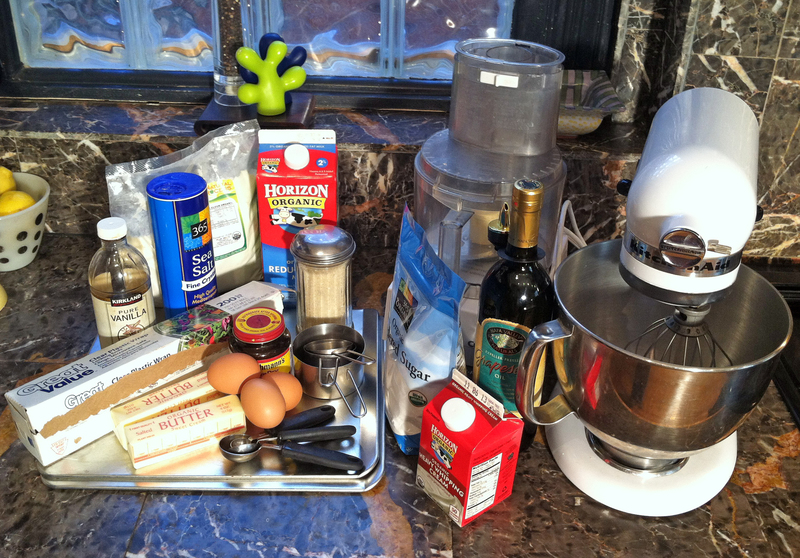 I may also try separating the Britt recipe and doing the separate butter layer, just for comparison. Step 3: Cutting and frying. After a day of rolling and chilling, it’s time for the fun part. Frying! As per the suggestion of a couple commenters on the original recipes, I let the dough rise 1-2 hours out of the fridge before frying. Not sure that was necessary, or even a good idea in hind-sight, but here at a mile-high, I figured a little extra rise-time couldn’t hurt. Next time, I’ll try it without the extra rise-time and see how it goes. 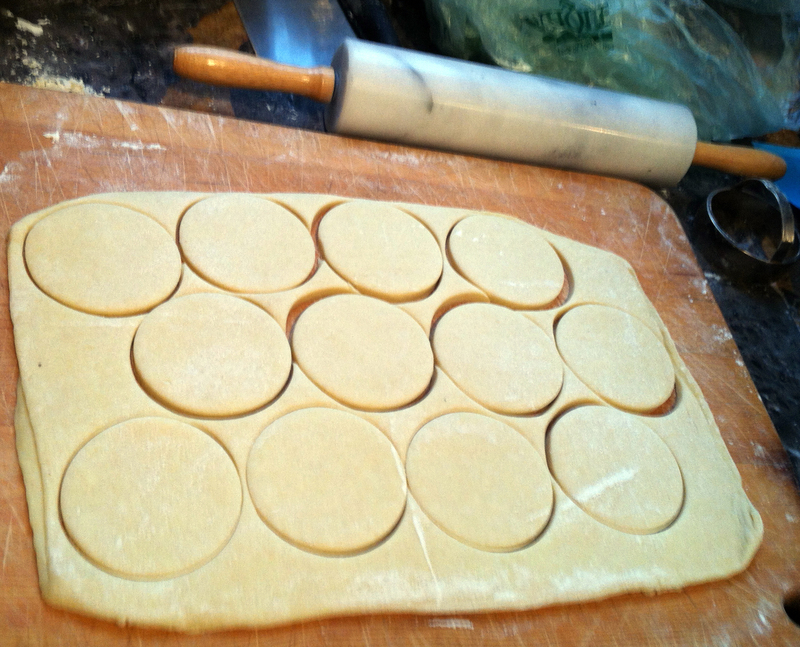 Also, I didn’t have a doughnut cutter, so I used a biscuit cutter. Next time I’ll spring for the doughnut cutter, as I suspect they would have come out a bit crispier with open middles, and a sharp edge to the cutter should help a lot, as I suspect I may have squished the edges of my dough too much with my dull biscuit cutter. That being said, they fried up perfectly. 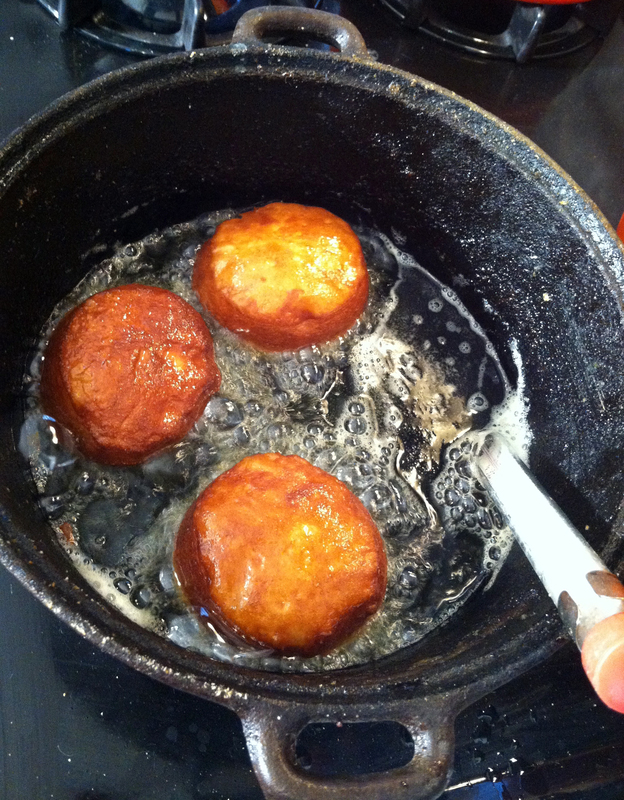 I kept a thermometer in the oil to keep it at 350, and I used grapeseed oil, as that is what the head honcho baker in NYC uses on his famous Cronuts. 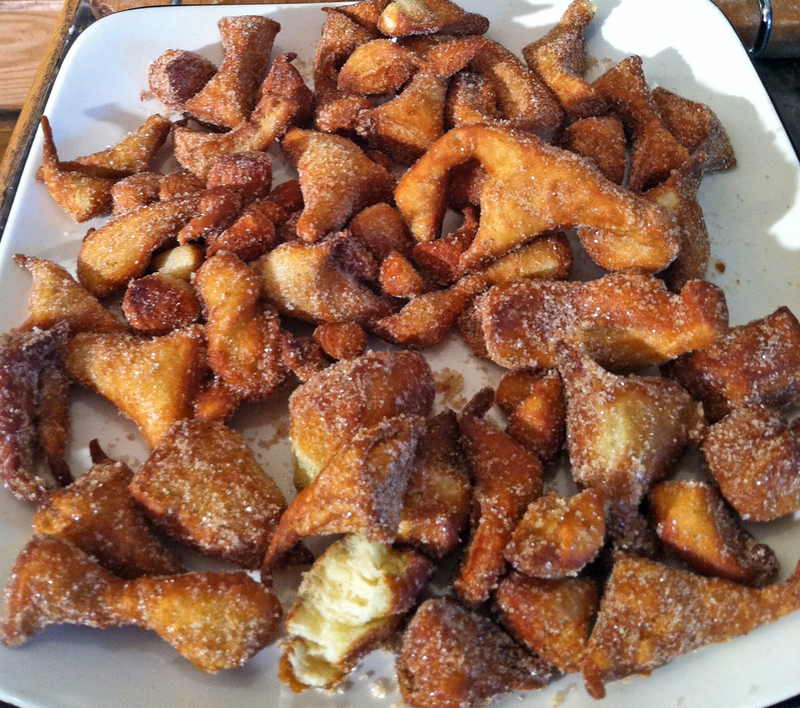 They all fried up very nicely, though I could tell by the weight the Food52 recipe yielded a heavier C’nut. I cut one from each recipe in half. Right away I knew it was a failure as none of them had the tell-tale crispy layers. The closest one was the Britt recipe (the one I didn’t screw up), which had a little bit. The big winner for taste and texture was also the Britt recipe, hands down. Light, melt-in-your-mouth deliciousness. Seriously the best donut I’ve ever eaten. 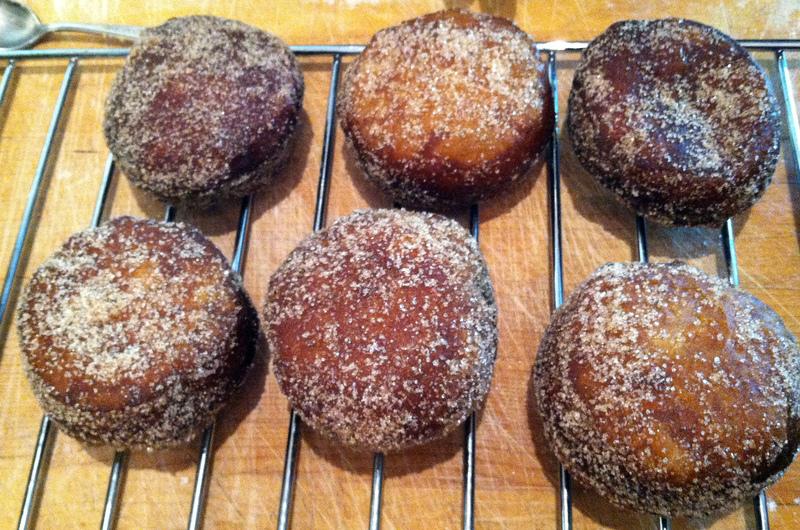 Whether they were glazed or filled or sugared, they were amazing. It was really really REALLY hard not to eat a ton of them. Everyone who tried them raved. My man must have eaten a half dozen (plus many “holes”). Even after he swore he would eat no more, I caught him sneaking down to the kitchen and pilfering another. The Food 52 recipe is good, just not great. A bit too dense and somehow just not as tasty. I’ll be sticking with the basic Britt Recipe, and experimenting with that one till I get it right. And then I’ll tell you how you can get them perfect, too, but in the meantime, I promise you will not be disappointed with this recipe! * I am still experimenting with the rise times, and will update when I know more. ** I will also be trying out different glazes and fillings, and will report on those as well. …and finally, don’t forget the best part, the scraps! Fry those up too. I am just a hobbyist here, by no means a pro baker, so if you see somehting I should be doing differently, please let me know. If you are also working on your Cronuts, I’d love to hear about it! Tell me in the Leave a Reply/Comments section below. 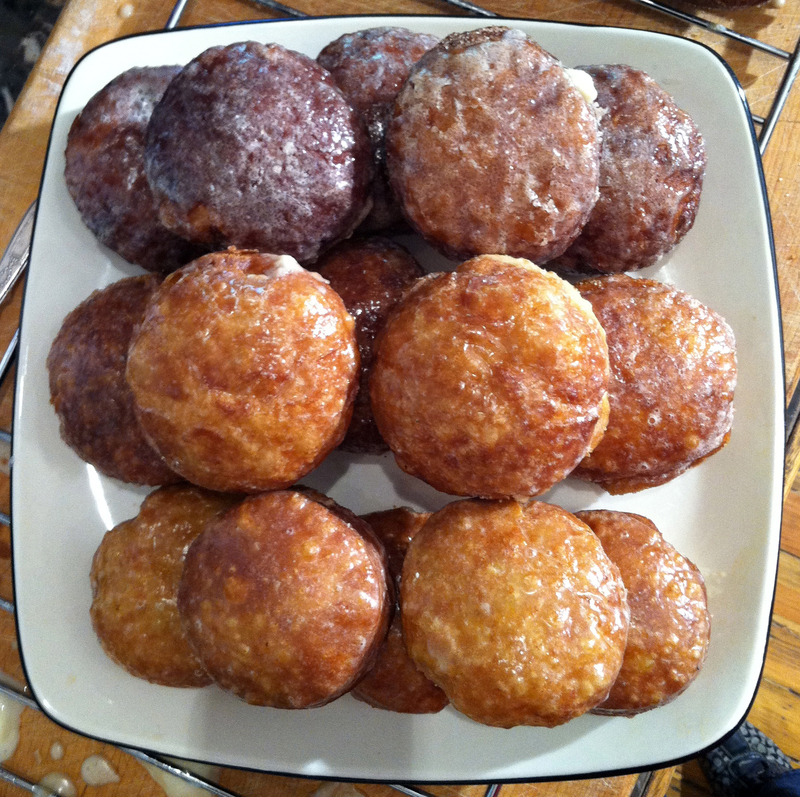 This entry was posted in baking, Denver, DIY, food, home, lifestyle, Uncategorized and tagged baking, best cronuts, best donuts, cronut recipe, cronuts, donut recipe, donuts, doughnut recipe, doughnuts, filled donuts, frying, glazed donuts, London Cronut, New York Cronut, NY Cronut, recipe. Bookmark the permalink. Hi there. I don’t know why you’d have problems printing the page, maybe try try good old-fashioned Cut n’ Paste? OH MY GOSH!!! I wish I found this post earlier! I just spent ALL NIGHT making the dough from Food52.com, just fried half of the dough, they’re so heavy and didn’t crisp at all. They brown too quickly, I assume the sugar caused it? UGH!!!! I am just craving some Britt’s donuts!